“Ennui” is the impatience and general disappointment that comes with not doing whatever it is you really want to do, and I’m certain it has been a constant companion of mine since childhood. I came out of the womb with a lot of ambition, and that desire to be doing something great never really went away. I settled it around the second grade that I wanted to be a writer. I loved words, and I wanted to write books that people loved. Unfortunately, my other aspirations were ridiculous. I wanted to be a spy à la Harriet and slink around my apartment complex in a yellow rain jacket jotting notes like “They’re onto me.” Not too long after that, I felt so strongly about my chances at becoming a singing sensation that I traveled door to door and asked people for money in exchange for songs. Furthermore, I was bummed when I realized that all of the calculated focus spent on my Jedi training was useless because Jedi weren’t even real. No matter where I was in my life, I was always pushing myself forward, enchanted by this idea that one day, far into the future, I would meander into what I was meant to do. And because there was no way that God could mean for me to live an ordinary life, whatever it was would be grand. I grew older and my ambitions veered into more socially acceptable directions. I spent some time wanting to study medicine in order to become a “blood up to my elbows” kind of trauma surgeon. After that, I was determined to become a theater actress, but that fizzled out when I went to college. I still maintained hopes about writing although it seemed so ludicrous that I relegated that dream to a fanciful hobby, and I decided to study teaching instead. But even after graduation, I kept my sights on something higher — the next big job, the next big adventure, etc. Looking Into the Future: What Is the Prize You Are Chasing After? That same kind of attitude can settle in us concerning matters of God. We place the future on some sort of pedestal, and we hail it as a prize to be won. Now, I agree with the fact that God leads us. I completely agree with the fact that He ordains things for us to do in life and in ministry. I know it was in God’s plans for me to marry Jamie Howard. I know it was in His plans for me to graduate with a degree in education. I know it was in His plans for me and my husband to buy our first home this year, and since then, we’ve worked hard to mark it as a place of surrender and worship. But just because those things were His plans for me doesn’t mean that they were mine to obsess over or chase after before the appointed time. Over the past few years, my husband and I have toiled over what God had for us in the future — children, missionary work, ministry endeavors, adoption, joint business ventures, etc. We looked into our future, and we dreamed and planned about what we thought God would send our way. But what God has revealed to us is that our focus on the future was taking away from our pursuit of Him in the present. We didn’t come to this realization through the course of a single sermon or a well-timed conversation with a friend. It was a slow dawning as we settled into a new home, a new church, and a new season of rest and renewal. And the more we leaned into Him and allowed Him to undo the knots in our thinking, the more clearly we could hear Him. That is the end goal, friends. Not marrying a godly person or raising godly children. Not pursuing godly ministry or starting godly businesses. The end goal is to know Him. 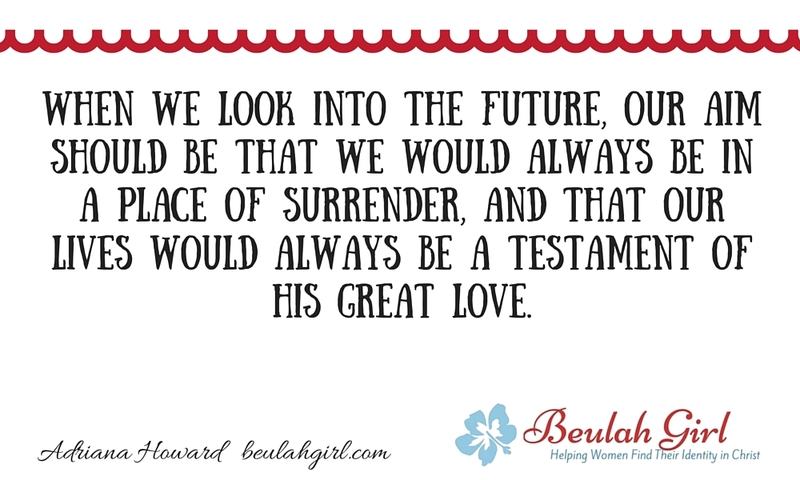 When we look into the future, our aim should be that we would always be in a place of surrender, and that our lives would always be a testament of His great love. And in pursuing that, God will lead us towards the desires of our hearts because our desires will be conformed to His desires. 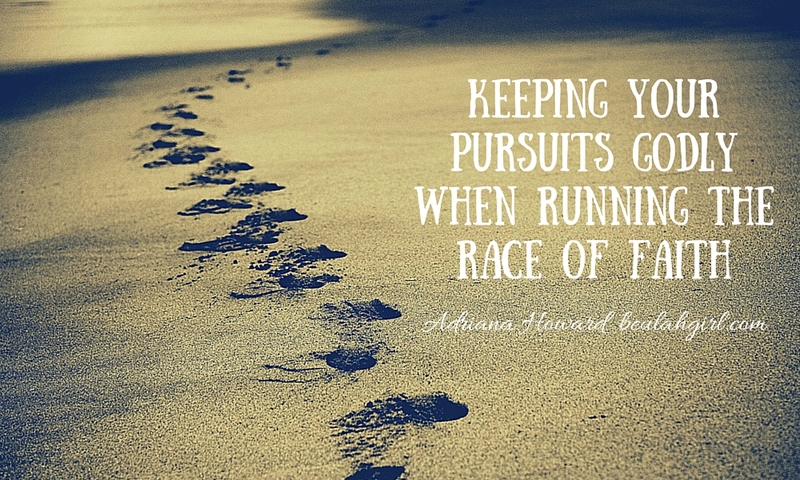 The race that my husband and I were running became about the places we would see and the things that we would do along the way instead of being about the prize. And that prize was Jesus, the only one by whom we would ever be able to achieve any of those things anyway. In fact, on some days, the race that we were running didn’t even lead to Him at all. It just led to us being happy and fulfilled. 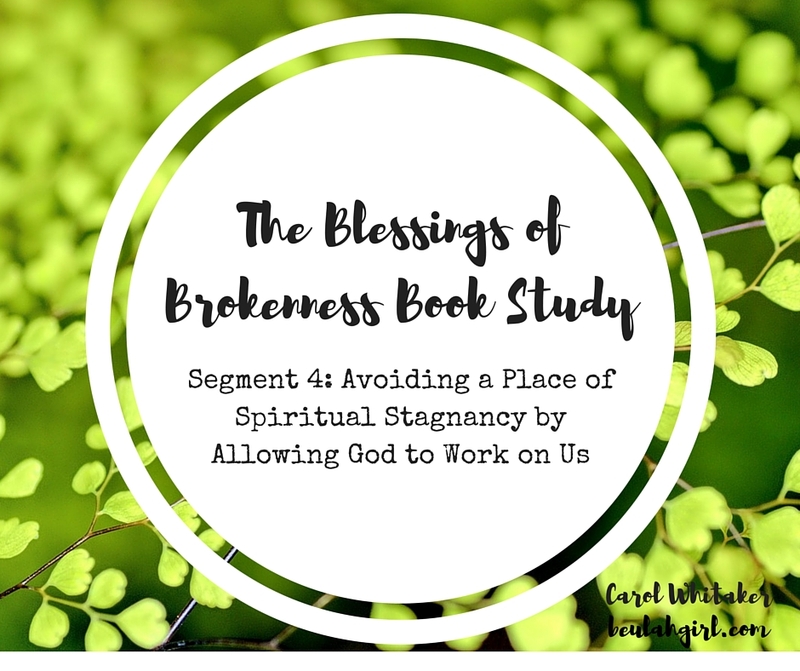 So here are some thoughts and questions that I encourage you to meditate on. They’re the same kinds of questions I’ve had to ask myself over the past few months. Think about your life and future. Think about the things that you are pursuing. Marriage? A family? A certain position in ministry? A particular job? Financial security? Saved family and friends? Ask yourself these questions: Have I placed any of those things before my pursuit of Jesus? Do I strive to know Him better every day? Do I surrender my will to His or do I hope His will will bend to mine? Has God already spoken and yet I’m still waiting for something better? Would I be content if His plans for my life look vastly different than I think they should? If your answers in any way reflect that the only desires of your heart are to see your own wants fulfilled, then I urge you to repent and then make it right. Turn away from that way of thinking, and chase after God in order to know Him better. I’m a work in progress, and while some days are better than others, I can honestly say that God is working out of me the desire to do as I please in favor of what He purposes for me. Thankfully, God doesn’t always allow me to get exactly what I want when I want it because if I could, I wouldn’t be the person that He needs me to be in order to see it done right. Paul said in Philippians 3 that things we “lose” are nothing compared to what we gain when we surrender to Him. And if His plans for your life look different than what you have planned for it, I encourage you reconsider your plans. A high cost was paid for your life, so, by all accounts, your life isn’t your own anymore. And if God’s intention for mankind was to leave our lives empty and devoid of passion and meaning, then I don’t think He would’ve pumped us so full of drive and ambition. But He wants to funnel that drive and ambition into His work, and in order for us to do that work well, to effectively partner with Him, we have to keep our eyes fixed on Him and nothing else. Hebrews 12 says that Jesus is the author and finisher of our faith. He writes our stories. And He alone can finish them. So let Him pen the story of your life, and trust Him to write it well.